Antenna Plus Double Cell/LTE~Triple WiFi~GPS Antenna is the all-in-one, low profile housing that provides 2 high gain Multiple-In, Multiple-Out (MIMO) Cellular/LTE antennas, 3 high gain WiFi antennas (802.11 abgn,ac), and a GPS antenna.This can come with a threaded bolt mount, permanent adhesive mount or magnetic mount; color choices of black or white. All antennas are built into one physical housing so that you only have to drill one hole for a fast and tidy installation. 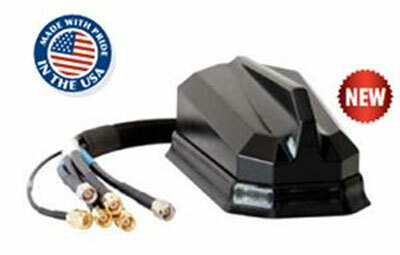 This reduces the need for multiple antennas on top of the vehicle. Connects to mobile data wireless routers with AirGain TWO Cellular/LTE ports, THREE WiFi ports and a GPS port.